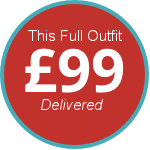 We have been successfully operating our mail order kilt hire service for many years now and don’t believe that you will find a better or more reliable service anywhere else in the UK, or deal with people who are solely dedicated to ensure that everything goes well on the day and that you look and feel good in your Scottish Highland dress outfit. All our outfits and accessories are made in the UK and are regarded as the genuine article, manufactured to a very high UK standard, we do not hire or incorporate any imported or cheap look-a-likes items in to our stock. We pride ourselves in operating a stress free Scottish Highland dress hire service delivering pristine high quality Scottish Highland outfits and accessories for your event. We work very hard to accommodate for all our customers needs and requirements as well as offering a friendly and helpful professional service. When possible we allocate all customers with the same member of staff to deal with your order until your event has passed, this provides customers with a more personal service and eliminates any chance of miss information being added into your order. For group orders, our outfits are packed and shipped individually in purpose built hard cases, ensuring that every outfit arrives individually named at its destination undamaged and ready to wear. Our small group of staff are dedicated and trained to ensure that your sizes are correct and that you have chosen the correct outfit for your event. Copyright © 2019 Mail Order Kilt Hire.